Yes it's gone quickly. The nights are drawing in. It's getting colder. But, turn those frowns upside down. It's a time to be jolly, because that means the ski season is nearly upon us. For those who are venturing to the mountains this season, be they beginner or expert, be warned; the mountain won't discriminate. While we may be excited our body will be nervous. And most particularly, our knees will be trembling. For this pastime is dangerous. And our knees take the biggest beating. So, today, sit comfortably, take some time to read the below and give yourself a head start. 1) Why are knees the most common skiing injury? Knees make up roughly 30-40% of all skiing injuries. They are by there very design a “hinge-joint” and therefore are inherently unstable. Our knees come under tremendous forces during a trip to the mountains, including, speed, posture, sudden changes of direction and rapid deceleration. These forces are magnified by the equipment we use. When we’re skiing we wear boots that are designed to support our foot and ankle, meaning that the majority of movement we’re putting into our legs comes from the knee and hip. As well as the boots, it's important to consider the settings on your ski bindings. But what does this mean? Well, the tighter your bindings are the less likely they are to come off in the event of a fall. The more experienced a skier you are, generally the tighter your bindings are to allow for harder skiing. This means that the ski is less likely to pop off when under force from hard skiing. However, if the ski doesn’t want to come off and you tumble, it is the knee is going to take a huge amount of the force. Therefore having a setting that is suitable for your experience is important. There are various different types of injuries that knees can sustain,whether it’s the ligaments, the cartilage or the bone itself. But either way, the knee is the major area where forces meet. Whether it’s a full “garden sail” (where you lose your ski’s and poles) on a double black diamond or a gentle innocuous tumble on a green, often the grade of slope you fall on has very little bearing on the damage done. I’ve personally seen more injuries on “easier” slopes than any others. 2) What other common contributing factors and common affiliated lower limb injuries are there from skiing? The most common causes of injuries to the lower limb are due to body position, speed and sudden changes of direction. This can come together at either high or low speed and the results can be dramatic either way. Other injuries that can commonly be found on the mountain are leg fractures, knee dislocations and occasionally hip fractures. These injuries are, again, often associated with falls and skis either not coming off, falling into objects like trees, or occasionally even people skiing into other people and causing nasty injuries. Less common are muscle ruptures. This tends to occur in the calf with older skiers that have lost some of their flexibility. Suddenly falling forwards, or even hitting a bump at speed can be the causative factor to muscle ruptures. Other factors around common injuries on the slopes are down to hydration or more correctly dehydration. When the muscles are less hydrated they’re more prone to injury by the simple fact that they’re less pliable and a sudden loading of pressure can cause them to be moved past their physiological end point. 3) What impact does this have on your life following injury? This is completely dependent on the damage that’s occurred to an individual. I’ve had a various injuries over the time I’ve been skiing, and mostly to my knees. I once dropped off a 6-foot snow bank in a complete white-out with minimal visibility causing me to twist and overload my knee. On another occasion, with my sister, we were skiing off piste and there were two narrow paths between some trees, one of which had a young sapling tree smack bang in the middle of it. Me being me, I chose the line with the sapling, and proceeded to ski directly into it and proceeded to wrap my knee and leg around this tree. That was another trip down the mountain on a blood wagon. As far as recovery for those two injuries though,it didn’t take any major length of time at all. I’ve regularly treated people that have injured themselves on the slopes, returned home and then sought me out to help return them to full function. I've therefore noticed similarities in their stories and subsistent recoveries. With knee injuries, when they’re on crutches, the first thing that is affected is their competency in getting around day to day. Getting in and out of a bath is remarkably tricky, better yet, driving or mastering the tube escalators. So that simple morning routine and commute to work soon becomes an obstacle course fraught with challenges. They often either suffer alone or strip their independence by asking for help from others. Both of which have an impact psychologically. Making a cup of tea is simple though. Except that both hands need to be on the crutches, so carrying a kettle, let alone filling it with water becomes a real chore. Once you’ve successfully navigated that tricky situation though, you’ve got no choice but to drink it where you are, because there is no chance of you carrying it through to the sitting room. I vividly remember one patient recount to me how he once made lunch, then attempted to take it through on a tray to the sitting room and it tipped him over the edge. Queue toys out the pram moment and him breaking down in tears. His ability to function as an adult had been stripped by, what had been weeks before, a really innocuous tumble on the slopes. If they’ve been unfortunate enough to be put into a plaster cast, the simple tasks such as showering become a balance exercises in keeping your leg away from water. This is not easy, and definitely doesn’t make for a relaxing cleanse. Not only that but the cast eventually gets itchy, and can even become loose when worn for long periods due to muscle wasting. Obviously, once you’ve injured yourself you’ve got to give the body time to heal. But when you’re in sustained pain for a period of time, it has the ability to change the chemical balance of your cerebral spinal fluid (CSF). This role of CSF in the body is to effectively feed the brain. Therefore, it has been shown that those in continual chronic pain are more likely to become depressed. The impact on your state of mind is therefore of high importance. In short, plenty. Simple exercises like standing on one leg to improve your balance are useful, or you can work up to jumping and landing on a single leg, then turn it up a notch and land on an uneven surface having done a 360° spin. For starters, the two simplest things that you can do to help prepare yourself for the slopes are working on your balance and giving your legs some extra strength so they can handle a day on the piste. Begin, by standing next to something you can hold onto for support whilst on one leg, then take the one off the floor and hold that position for 20seconds. As it becomes easier, try closing your eyes. 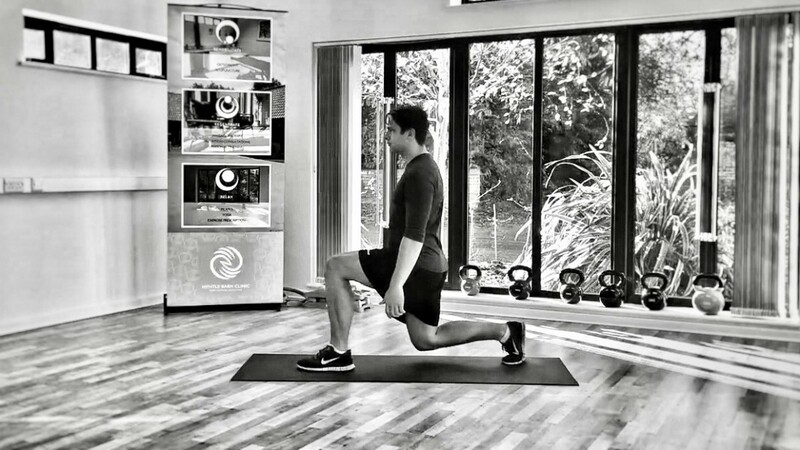 To progress this exercise, perform the same exercise, but then bend the knee slightly whilst keeping your knee over your toes so that there is no lateral movement of it. Repeat this 10times in a steady motion. Next take one foot in front of the other and perform a lunge forwards ensuring that you keep the knees and hips at 90°, you can up the ante by carrying some weights with you as you lunge forwards. This serves to both challenge your balance whilst simultaneously strengthening your legs. Another simple exercise is to keep your feet shoulder width apart, and using a work surface as support, lower yourself into a full squat position with your backside onto your heels. Use the work surface as support as needed. All the while, it is important to ensure that your heels are on the floor and that your chest is upright keeping a strong posture though your back. Repeat this ten times. There are plenty of exercises you can perform in the gym also. The key point to remember is that any program you undertake to ready yourself for the mountains should take a steady approach and start well in advance of your trip. A week of training is certainly better than none, but it is much better to have put in 4-6weeks of prep that combines balance, mobility and strengthening exercises. This will hopefully ensure that you’re in a good shape for the mountains as well as enabling you to minimise the risks of injury. 5) What preventative measures when on the slopes to prevent injury? Once you’ve arrived in the mountains, whether you’ve been putting in months of preparation, or only just started thinking about it on the transfer up the mountain. There are certain things you can do to help yourself to have a great day and minimise your risks of injury. If you are someone that’s ski’d since you could walk, or a complete beginner coming to grips with walking in ski boots for the first time, there are a few measures that you can be aware of that will keep you smiling….in spite of the cold. At this point, ensuring you’re well hydrated is a strong starting point. When travelling to altitude, it’s a good option to drink plenty of water en route as it puts you in a place where your tissues are at their healthiest. High quantities of caffeine and alcohol will compromise this as they act as diuretics. 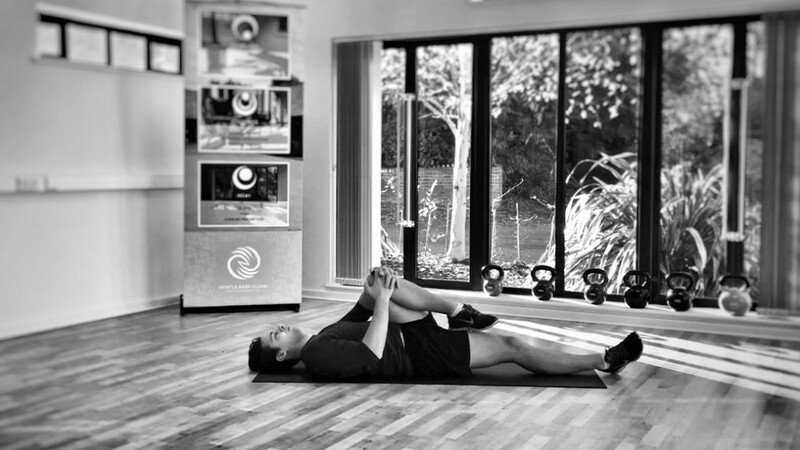 Each morning there are four exercises that I would encourage all people to do, to help stretch and mobilise the joints and muscles of the legs. 1) Standing next to something that you can hold onto, then lunge forwards with one leg and lower it so your back knee touches the floor whilst all the while ensuring your torso is upright. 2) Leaning with your hands up against a wall, with one leg in front of the other. Ensure that the heel of the back foot is off the floor and your pushing your weight way from the wall and loading your weight into the heel. When doing this you should feel a stretch down the back of your lower leg. Hold this for 15 seconds. 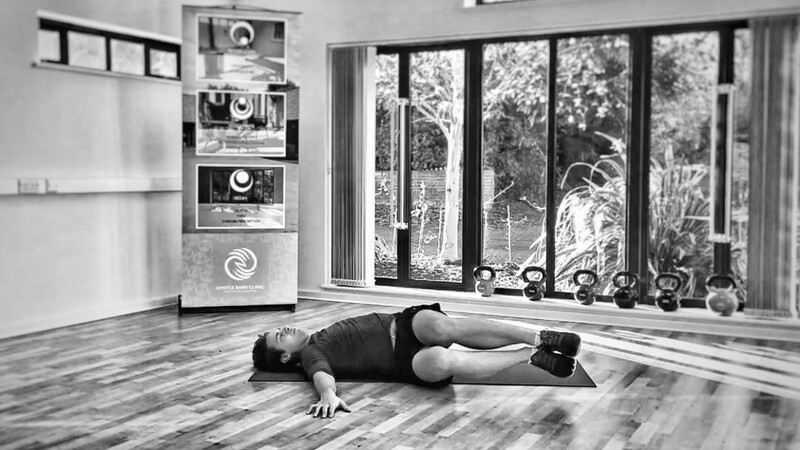 Using the floor from a push up position for support, aiming to drive the heel towards the floor. 3) Lying on your back on the floor. Raise your knees up so your feet are off the floor and your shins are parallel to the floor. At this point, spread your arms out to the side as if you’re creating a T-shape. Then, lower your knees down towards the floor ensuring that the shoulders remain held to the floor. 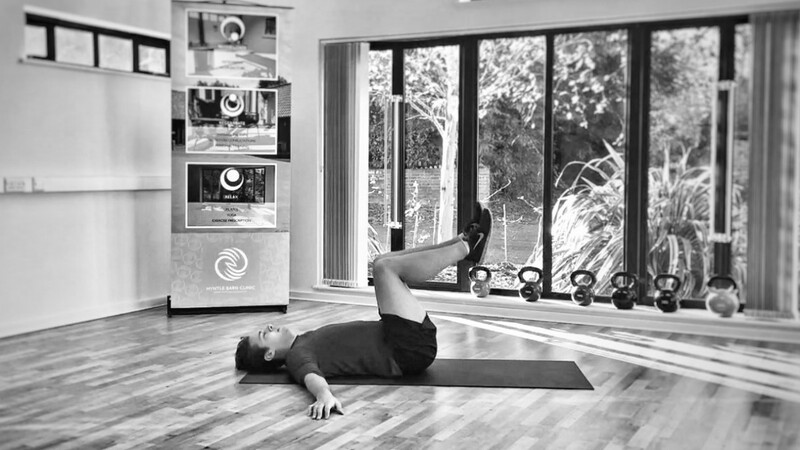 This will help mobilise your back as well as to stretch out some of the core muscles. Start with your arms out wide, palms flat to the floor and your knees and hips at 90 degrees. 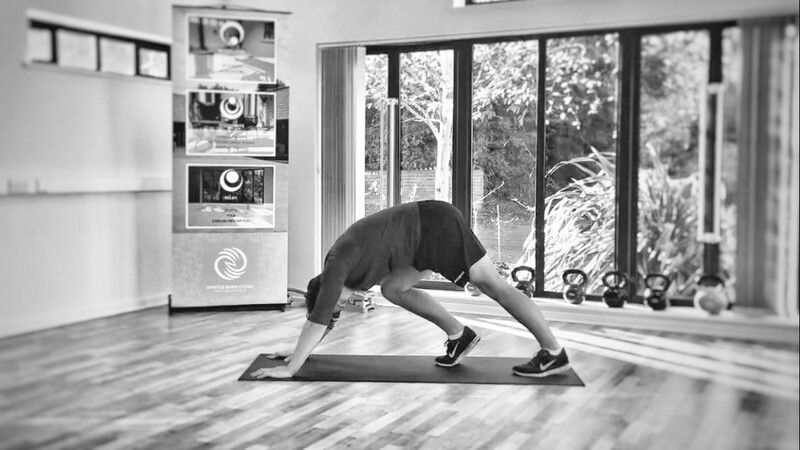 Keep your shoulders flat on the floor and let the knees drop towards the floor either side. 4) At this point it is important to stretch a group of muscles that are integral for skiing. Whilst still on your back, one leg stretched out and the other held by the knee. Pull it across your body, feeling for a stretch into your buttock, hold for 15seconds and repeat on the opposite side. Pull across your body, feeling for a stretch into your buttock. Keep you back flat to the floor and focus that stretch into the buttocks. So, avid skiers, boarders, mountain lovers. Take note. Learn from the above. Preparation and prevention is key. I don't want to be seeing any of you hobbling over to me. I will help, of course, if you are unfortunate enough to need me. But take care and stay safe. Look out for upcoming articles on skiing injuries and how to help prepare and prevent. I have seen first hand, the benefits of 'ski-fitness' whilst training many ski enthusiasts. The feedback received after completing a course of ski specific training and returning home after a successful trip on the slopes has always been fantastic. Clients have reported less joint pain, less falls and faster recovery from long days. 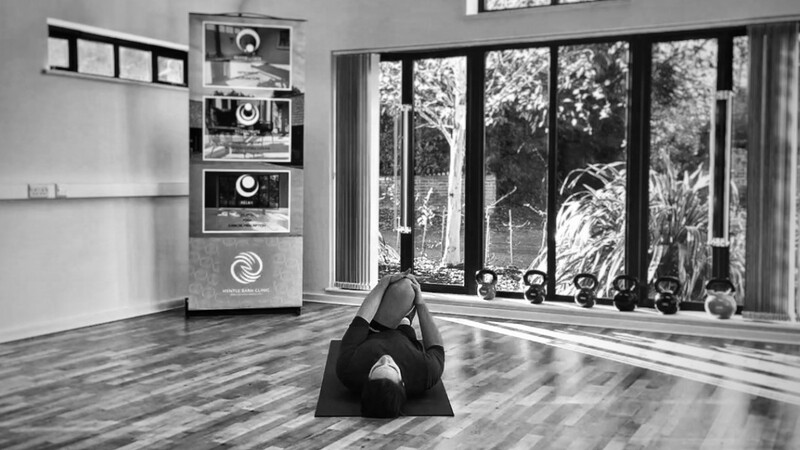 This has been achieved very simply through effective balance, core and strength based exercises suitable for all abilities and ages. Preparation is definitely the key! I must admit i am guilty of braving the slopes with no real foresight to my condition. Some good advice and simple to follow instructions. Any avid skiers out there will know how much you ache when coming off the slopes at the end of the day, so anything to help with this deserves attention. Coming from a complete rookie who would love to ski in the future, this has given me an insight in the prehab that I can do before setting out on my snowy adventure. Also great visual aids to suggest patients to when they are thinking about a ski trip.